Achieve true beauty sleep with the Omorovicza Midnight Radiance Mask; a dual-effect product to hydrate, brighten and transform skin overnight. 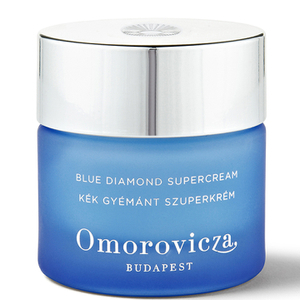 Fortified with the signature Hydro Mineral Transference™ system for maximum efficacy, the thick, gel-based formula melts into skin with a refreshing cooling sensation, delivering an instant moisture boost with Red Algae and Hyaluronic Acid helping restore elasticity levels and create a plumping effect. Oil-regulating extracts of Black Willow and Salicylic Acid then work together to slough away dead skin cells and unclog pores with gentle chemical exfoliation, resulting in a more even surface texture that feels sumptuously softened and supple. The addition of Sand Lily helps alleviate the appearance of dark spots and discolouration for a more even and flawless tone. Awaken to a rejuvenated and revitalised complexion, drenched with much-needed moisture and left with a dewy, healthy-looking radiance. Suitable for all skin types, in particular those with hyperpigmentation or oiliness. Aqua (Hungarian Thermal Water), Glycerin, Propanediol, Yeast Extract, Sodium Levulinate, Sclerotium Gum, Carbomer, Chondrus Crispus Powder (Carrageenan), Sodium Anisate, Ethylhexylglycerin, Kaolin, Benzyl Alcohol, Salix Nigra (Willow) Bark Extract, Caprylyl/Capryl Glucoside, Salicylic Acid, Sodium Hydroxide, Parfum (Fragrance), Copper Gluconate, Sodium Hyaluronate, Phospholipids, Leuconostoc/Radish Root Ferment Filtrate, Pancratium Maritimum Extract, Helianthus Annuus (Sunflower) Seed Oil. For best results apply a thin, even layer in the evening following cleansing and toning. Leave on overnight and cleanse your face as normal the following morning. Use 2 - 3 times a week to maintain a brighter, more even-toned complexion. Tip: Store in the fridge for an intensified cooling sensation.